New York City band Radio Jarocho plays son jarocho music fashioned after the towns, musicians and swampy countryside of Veracruz, Mexico. They also write their own songs inspired by this popular genre and tailor them with assorted influences creating a contemporary repertoire that albeit captures the spirit of the traditional style. They are now joined by master jarana player, composer and poet Zenen Zeferino Huervo, whose 20+ year career makes him one of the foremost representatives of this genre! El concierto empezará a las 8:30 y habrá fandanguinto después. ¡No se lo pierdan! 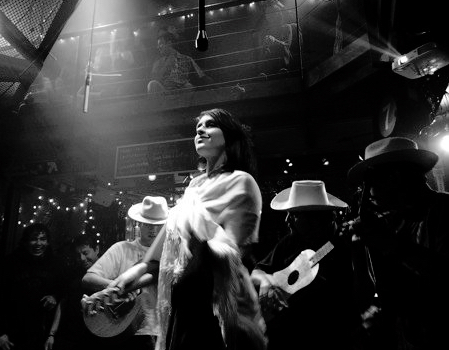 Radio Jarocho at Terraza 7 on Friday May 13th, 2016 at 8:30 pm. No Replies to "Radio Jarocho"